Within the lifecycle callback methods, you can declare how your activity behaves when the user leaves and re-enters the activity. For example, if you’re building a streaming video player, you might pause the video and terminate the network connection when the user switches to another app. When the user returns, you can reconnect to the network and allow the user to resume the video from the same spot. This class explains important lifecycle callback methods that each Activity instance receives and how you can use them so your activity does what the user expects and does not consume system resources when your activity doesn’t need them. Unlike other programming paradigms in which apps are launched with a main() method, the Android system initiates code in an Activity instance by invoking specific callback methods that correspond to specific stages of its life cycle. In this state, the activity is partially obscured by another activity—the other activity that’s in the foreground is semi-transparent or doesn’t cover the entire screen. The paused activity does not receive user input and cannot execute any code. While the activity’s first lifecycle callback is onCreate(), its very last callback is onDestroy(). The system calls this method on your activity as the final signal that your activity instance is being completely removed from the system memory. Most apps don’t need to implement this method because local class references are destroyed with the activity and your activity should perform most cleanup during onPause() and onStop(). However, if your activity includes background threads that you created during onCreate() or other long-running resources that could potentially leak memory if not properly closed, you should kill them during onDestroy(). During normal app use, the foreground activity is sometimes obstructed by other visual components that cause the activity to pause. For example, when a semi-transparent activity opens (such as one in the style of a dialog), the previous activity pauses. As long as the activity is still partially visible but currently not the activity in focus, it remains paused. However, once the activity is fully-obstructed and not visible, it stops (which is discussed in the next lesson). 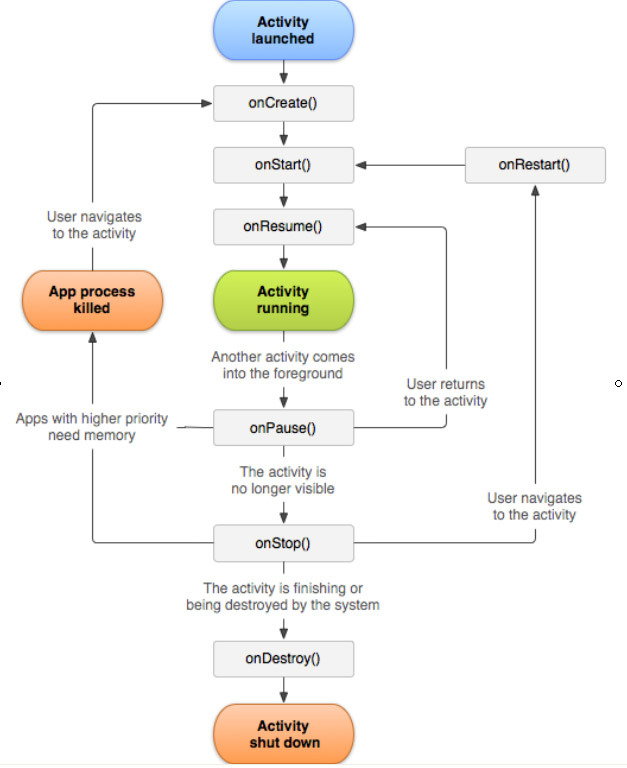 As your activity enters the paused state, the system calls the onPause() method on your Activity, which allows you to stop ongoing actions that should not continue while paused (such as a video) or persist any information that should be permanently saved in case the user continues to leave your app. If the user returns to your activity from the paused state, the system resumes it and calls the onResume() method. • The user opens the Recent Apps window and switches from your app to another app. The activity in your app that’s currently in the foreground is stopped. If the user returns to your app from the Home screen launcher icon or the Recent Apps window, the activity restarts. • The user performs an action in your app that starts a new activity. The current activity is stopped when the second activity is created. If the user then presses the Back button, the first activity is restarted. • The user receives a phone call while using your app on his or her phone. The Activity class provides two lifecycle methods, onStop() and onRestart(), which allow you to specifically handle how your activity handles being stopped and restarted. Unlike the paused state, which identifies a partial UI obstruction, the stopped state guarantees that the UI is no longer visible and the user’s focus is in a separate activity (or an entirely separate app). There are a few scenarios in which your activity is destroyed due to normal app behavior, such as when the user presses the Back button or your activity signals its own destruction by calling finish(). The system may also destroy your activity if it’s currently stopped and hasn’t been used in a long time or the foreground activity requires more resources so the system must shut down background processes to recover memory. When your activity is destroyed because the user presses Back or the activity finishes itself, the system’s concept of that Activity instance is gone forever because the behavior indicates the activity is no longer needed. However, if the system destroys the activity due to system constraints (rather than normal app behavior), then although the actual Activity instance is gone, the system remembers that it existed such that if the user navigates back to it, the system creates a new instance of the activity using a set of saved data that describes the state of the activity when it was destroyed. The saved data that the system uses to restore the previous state is called the “instance state” and is a collection of key-value pairs stored in a Bundle object.